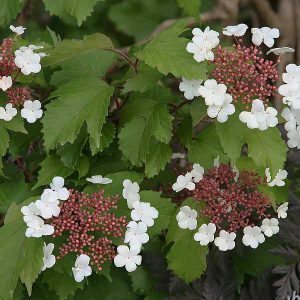 With two tone lace cape flowers and attractive foliage Viburnum sargentii ‘Onondaga’ is a must have Viburnum. It grows well and flowers in part shade to full sun, we think it is at its best where it gets a little afternoon shade. The new foliage emerges a soft brown before turing to a good mid green with a fine texture. The pink buds in early spring are followed by flowers, pink buds surrounded by a circle of white flowers, held above the foliage which provides a great contrast. The inner pink buds will open later in spring and it is these that are followed by the red berries. To top off the seasonal display the foliage puts on very good red autumn tones as well. Best planted in a humus rich well drained soil, Viburnum ‘Onondaga’ will require some water through the first summer. In warmer climates we suggest a position in a little afternoon shade, perhaps near the drip line of a larger deciduous or evergreen tree. Give the plant some room as it does have a naturally attractive growth habit. After planting, water in well with a liquid seaweed fertiliser, and then mulch around the plant to maintain a cool moist root run. Easily pruned to size, Viburnum sargentii ‘Onondaga’ will reach around 2.5 metres in height with a similar spread. Fertiliser – Use a slow release type in spring and a liquid type at the end of spring. Mulch – Mulch around the plants to maintain a cool root run. Watering – Water well through the first summer. After this you should only need to water during long dry periods. Pruning – The best time to prune is in autumn.